Fr. Serge Keleher was one of the greatest friends of Ukraine who is not well known in Ukraine. I knew him for nineteen years and I am happy to share my personal impressions of this most remarkable person and priest. He did much to help oppressed believers, (who lived behind an ‘Iron Curtain’) during an ideological ‘Cold War’ that mocked God and brutalized humanity. First, I will share some of his biographical information and then try to capture the essence of the ‘larger than life’ Fr. Serge. Brian Eugene Regis Keleher was born on 7 June 1942 in the French Hospital in New York City to Irish American parents; James and Dorothy Keleher. He was Baptized a Roman Catholic in the hospital Chapel and his Baptism is registered at St. Michael’s Roman Catholic Church in mid-town Manhattan. He received the Sacrament of Confirmation in St. Jean Baptiste Roman Catholic Church, also in Manhattan. He graduated from River Dell High School, in New Jersey in 1960 and he joined the Eastern Orthodox Church in February 1961. 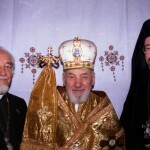 From 1969 to 1964, he studied in St. Vladimir’s Orthodox Theological Seminary. He was ordained subdeacon in October 1964 by Bishop Dositheus (Ivanchenko) in St. Demetrius Church, Jackson, Michigan. From 1964 to 1967 he resumed his studies and in 1966 he earned a B.A. in Political Science and Religious Studies from Michigan State University. He became very interested in Liturgical Studies and he attended Notre Dame Summer School of Liturgy in 1966 and 1967. He was ordained deacon in June 1966 in Ohio by Metropolitan John (Wenland). Just over a year later he was ordained priest, taking the name Serge, by Bishop Dositheus (Ivanchenko) in St. Nicholas Cathedral, New York City. Not long after he was appointed as Pastor of Holy Trinity Church in Baltimore Maryland. He served there until 1970. Then the direction of Fr. Serge’s priestly life changed. Archbishop Joseph Raya (Archbishop of Galilee, Palestine) reconciled him back to the Catholic Church and he was assigned to the Ukrainian Catholic Eparchy of Toronto, Canada. Archbishop Raya (now Fr. Serge’s spiritual father) supported Fr. Serge’s desire to begin to review and reprint liturgical texts and to begin the restoration of existing but very old liturgical text books. With the kind support and funding of many great people, many valuable liturgical texts were preserved and republished as exact copies of originals and in their original languages. It was very labour intensive work but the results were very impressive. He loved this traditional monk-like work and he was recognized as a world expert in this field and he continued this labour of love until his heavenly repose. In 1971 Fr. Serge was assigned to serve in Holy Ghost Church in Wellland, Ontario. The following year he was asked to serve in Holy Protection Church and Holy Cross Church in Thunder Bay, Ontario. He was also responsible for 5 mission stations (Geraldton, Nipigon, Attikokan, Fort Frances and Rainy River). Later he was assigned as Chaplain to the Missionary Sisters of Christian Charity in Queenstown, Ontario. In 1974 Fr. Serge he was invited to do chancery work along with his priestly duties. On Sundays he often had to travel more than 500 kilometres to fill-in for priests who were on leave or parishes that were between priests. At the same time he resumed his Theological studies at the University of St. Michael’s College, University of Toronto, under the direction of Professor (later Archpriest) Petro B. T. Bilaniuk. He received an M.A, in Sacred Theology from Emmet Cardinal Carter, in 1980. He never pursued a doctorate but his scholarship was recognized in the fact that he was consulted often on many important religious issues by high ranking clergy and lay people. Fr. Serge was fully a Catholic and he was always first to comment and to provide practical support when Catholic (or any) other people were being abused. This naturally led him to support the plight of Catholics in Northern Ireland during the ‘pogroms’ where Protestant paramilitaries engaged in what can only be called sectarian ethnic cleansing by burning Catholics out of their homes. Fr. Serge befriended Cardinal O’Fiach, made contact with Irish Republican leaders and was available to assist in many ways with his advice and experience as well as the Sacraments of the Church. He told me that he visited some of the Irish Republicans who were on a hunger strike against British prison policy and British atrocities against Irish Catholics. At that time in Northern Ireland (only 40 years ago) Roman Catholics were restricted in access to University education, to management positions in workplaces, to freedom of movement and to many ordinary civil rights. Fr. Serge was able to share with the Irish Republicans his experiences in the American Civil Rights Movement, where he supported equality for coloured peoples. These movements were very bitter and led to the assassinations of Irish American President John F. Kennedy, his brother Robert Kennedy and Dr. Martin Luther King Jr. (at which Fr. Serge told me he was a pall-bearer). Fr. Serge also was involved in assisting Catholics in China (he spoke a little Chinese) but that story cannot be told at this time due to the ongoing situation. Fr. Serge first visited Ukraine (then in the Soviet Union) in August 1981. From that time he became very involved in efforts on behalf of the persecuted Greek-Catholic Church. His activities in this regard intensified over the next ten years. In 1989 with the support of Bishop Basil of Stamford and the blessing of Bishop Isodore of Toronto Fr. Serge moved to Dublin in Ireland, to take up a position at Keston Institute Oxford, England, with responsibility for all matters relating to the Ukrainian Greek Catholic Church. He commuted regularly from Dublin to Oxford. Between 1989 and 1992 he visited Ukraine more times than he could remember and he was able to record valuable information, as well as set up networks of support for the UGCC clergy and faithful in many ways. Much of this work still remains unwritten (and I did ask him to do so many times) due to the necessity for secrecy at the time of the ‘Cold War’ and due to the official persecutions and the infiltrations on many levels. If you are Ukrainian, you know and understand, because you lived in these times. But maybe you didn’t know that a very large and very smart Irish-American priest was planning Ukrainian freedom and sharing information about Ukrainian struggles with the world, and all from a small house in Dublin, Ireland. For these activities, Fr. Serge told me he was awarded all the honours the Church could give. He named sixteen of them to me. Few except his close friends know this. In the late 1980’s it became obvious that the USSR was failing. Their systems began to crack and crumble and some type of break-up was expected. It was a joyous day, and a day of great thanksgiving to God, when the Church became free in Ukraine. This really came to world attention when Pope John Paul II visited Ukraine. Fr. Serge, of course had some part in the planning and he ghost-wrote one of the Pope’s speeches (as he did for an uncountable number of communications from other Eastern Church leaders). The rest of this story you know. A lot of educating, building and re-generating of the UGCC needed to be done. In the beginning overseas assistance was greatly relied upon at all levels. Fr. Serge involved himself in this in every way he felt that was useful. 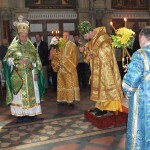 Today, 2012, only one generation later, the UGCC is the most organized most educated organization in Ukrainian society. What a wonderful achievement in such a short time! In 1992 Fr. Serge celebrated the Silver Jubilee of his ordination. Through his writings, a group of his traditional Latin Catholic friends had become interested in the Eastern Churches and they decided to organize a Divine Liturgy to celebrate the occasion. The chief celebrant was Bishop Basil of Stamford. Bishop Vsevolod of Scopelop also came and many others. The group organized chanters and all the basic essentials for a Divine Liturgy. These Liturgies continued on a monthly basis and then a weekly basis in St. Paul’s Church in Arran Quay, Dublin. They were mostly in the Greek language in the beginning and occasionally in Old Church Slavonic (his favourite language) and then in the Irish language. It was here that I first met the very large and vivacious ‘Monsignor’ (as I called him). Over time he convinced me to assist with serving at the Divine Liturgies in Dublin and on pilgrimages. Cardinal Connell asked the Greek Congregation to move to St. Kevin’s Oratory in the Pro-Cathedral because St. Paul’s needed structural repair work. But there was no Ukrainian presence until 1999, and this happened totally by co-incidence (or the Will of God). A lifelong friend of Fr. Serge, Fr. John Lundberg was coming to celebrate Pascha in Dublin. Fr. Serge arranged for him to stay at a local guesthouse. While both priests were speaking in the guesthouse a woman came up to them, and seeing how Fr. Serge was dressed, she asked in Ukrainian if he was a priest. ‘Indeed I am’ he replied. Zenovia was overjoyed. She came to the Divine Liturgy the next Sunday, and the Sunday after she arrived with more Ukrainian Greek Catholic friends. All were overjoyed and we were very happy to welcome them. This marked the birth of the Ukrainian Greek Catholic Community in Ireland and it has grown ever since. In the following years Fr. Serge was visited by many of his friends and we got used to serving for (and entertaining) visiting Bishops; including Bishop Peter Stasiuk, Bishop Paul Chomnycky and mainly Bishop Hlib Lonchyna. 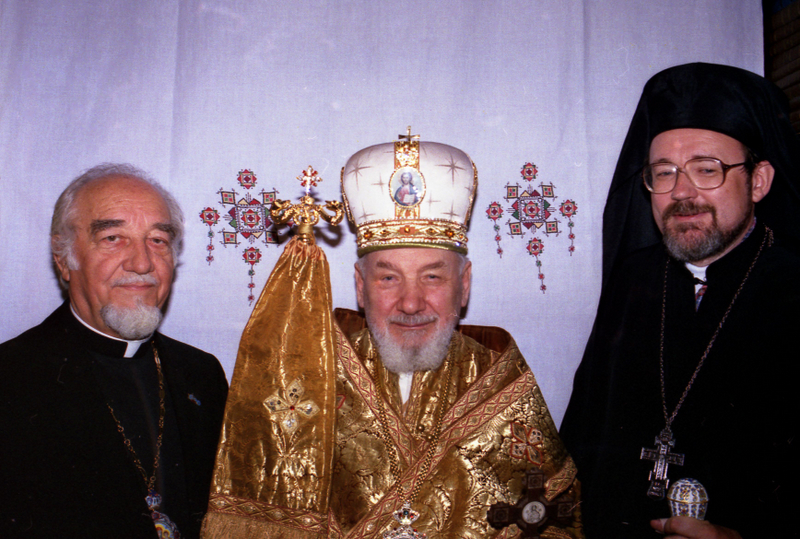 In 1992 we were also visited by Patriarch Gregory III of Antioch and Jerusalem. He consecrated the Patronal Icon of our Community, that of Blessed Nicholas Charnatsky, (who had visited Ireland during the 1932 International Eucharistic Congress). More recently, His Beatitude Sviatoslav, visited during the 2012 International Eucharistic Congress. Sadly, Fr. Serge didn’t live to see this wonderful event. Fr. Serge loved and knew the Divine liturgies of all the Churches, East and West, in great detail. He believed totally in the Divine Liturgy and he strongly defended it against those who sought to change or dilute it. Publicly, Fr. 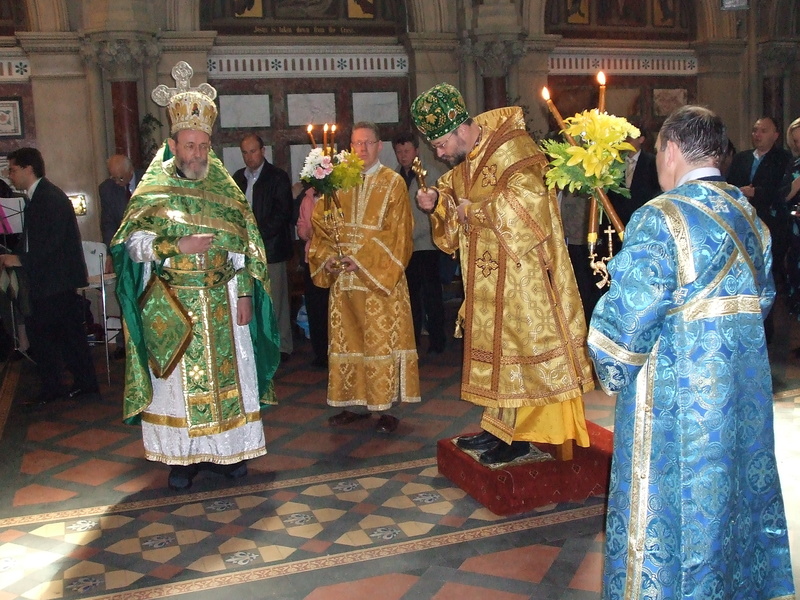 Serge offered the Divine Liturgies of St. John Chrysostom and Basil. In private, in his latter years, he preferred the Old Latin Rite. He was also involved in the restoration of the Old Latin Liturgy (at the highest levels) because he saw no reason or evidence that this Rite was ever, or could ever be, abrogated. He was vindicated and there was glee in the tone of his mail to me in 2006 that Jorge Cardinal Medina Estevez, former prefect of the Congregation for Divine Worship, had publicly declared this. Recent statements by Pope Benedict XVI have also copper fastened this. Fr. Serge’s priestly approach was that of a loving Christ-like father. He knew that it is almost customary for Eastern priests to adopt a demanding style of administration but he felt it was more Christ-like to behave as a loving father. No matter how busy he was, he always made time for his parishioners. His priestly duties always came before everything else. He used to describe himself as a priest who really does pray for the people who ask for his prayers. His prayers were very powerful and I have known them help many sick people. He was always first to visit the sick. He offered prayers and lightened their moods with stories of his ‘infamous’ Aunt Margaret. He also comforted the dying and was great support to me (as was Bishop Hlib) when my own parents reposed in the Lord. For the same reasons Fr. Serge also preferred the traditional sacramental rites. In Ireland he always performed Baptism by immersion. So I was surprised when I came to Ukraine, and my Daughter Teresa was born the priests looked puzzled when I asked them to do this. No problem, a call to Fr. Serge got a reply of many pages of Canon Laws (East and West) showing that this is the correct canonical Baptismal sacramental procedure. He also included some writings from his good friend Fr. Robert Taft, S.J. and anecdotes of how Fr. Robert baptised children by immersion. However there was no need to quote canons. The local priests were happy to confer the sacrament in the traditional way. Thank God for all that is good! Fr. Serge was also available to help Ukrainian parishioners in their complicated dealings with Irish authorities on various issues relating to immigration, registration, work references, education, housing and integration in many ways. The Ukrainian community in Ireland didn’t know about his other works. To them he was Fr. Serge, their priest. As such, they loved him and made regular collections to support him in his final years because he had only a small pension from Canada to live on and he had high costs related to his medical condition. In his day, Fr. Serge knew everybody who was anybody in the Church, and they knew him, because was impossible not to notice. He had anecdotes about many Church figures and they had anecdotes about him. Among my personal favourites are the story of the two Cardinals and the cow; where one Cardinal bought a cow from another and sought to return it because it stopped giving milk (look it up!). At an important conference somebody started making some extraordinary comments. Fr. Serge made a paper plane and threw it. Seeing this, many others did the same. Once a local Dublin man asked Fr. Serge why he was wearing a strange hat (Eastern Catholic attire is not common in Ireland). ‘Because I like it’ replied Fr. Serge. His birth name was Brian, but he was always known as ‘Brain’ Keleher because he was very smart. Church authorities acknowledged this when the sent him a certificate awarding ‘Brain’ Keleher the position of Monsignor. In his own words ‘a friend in Canada made one of those funny tape recordings of himself singing Ukrainian Christmas hymns in four-part harmony. Many people have commented on how nice the recording is, and how they would enjoy hearing the quartet give a live concert!’. Met. Kallistos is reported to have said to Fr. Serge that it was not enough to have the Orthodox faith; it was also necessary to be under the Orthodox hierarchy. ‘Which one?’ replied Fr. Serge. It’s not polite to publish the answer that is attributed to Met. Kallistos. Fr. Serge loved books and he had a collection that was admired and coveted by many visitors. He also wrote many books and many thousands of articles (also ghost writing for others). He was editor of the Eastern Churches Journal (from 1994). He wanted his books to stay in Ireland in one collection there were no facilities to do this, so they were all stamped, ‘The Serge Keleher Collection’ and some went to Lviv, some to London and many still remain stored in Dublin, I think unsorted and boxed. I often borrowed books from him (as did many others) and I learned a lot about Liturgies, Patriarchs, traditions, Theology and the Genocidal Famine of 1932-1933 (Eternal Memory). In fact the last sentence of the last line of his last email to me (a few weeks before his repose in the Lord) related to books. He was concerned that Ukrainians in Ireland didn’t have great access to good spiritual books. His last written words to me were ‘Svichado, we must do more to promote Svichado’. Well done, . . . well written, . . . rev. Serge Keleher was all of the above and more! 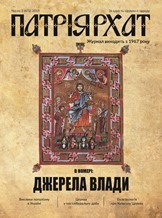 The only thing he did not complete – was a biography of Bishop Izydor Boretsky.